A couple of months ago we shared a collection of some of the best websites that offer open digital textbooks (e.g. OER Commons, Open Textbook Library, MERLOT, TextBookGo, Bookboon..etc). 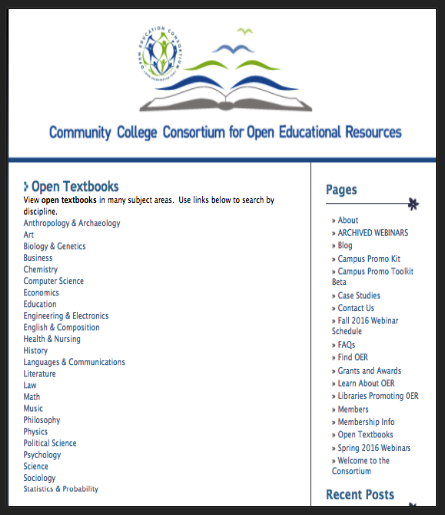 Today we are adding another equally important resource that features tons of open textbooks. 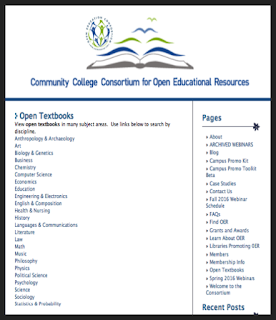 Community College Consortium for Open Educational Resources embeds a wide variety of digital textbooks covering various subject areas. These include : Art, Math, Music, Psychology, Science, Physics, Education, Chemistry, Computer Science, History, Language and Communications, Economics and many more.